Yesterday we got a break from the grayness and a tiny taste of spring. Boy was it ever yummy – kind of like a big dollop of plain hot fudge or a juicy Dungeness crab leg. We grabbed the chance to take advantage of the sun shining down on us Tacomans and walked the waterfront along Ruston Way. Mother Nature made a mighty beautiful landscape there and others have helped it along with parks, sidewalks, restaurants and a hotel. 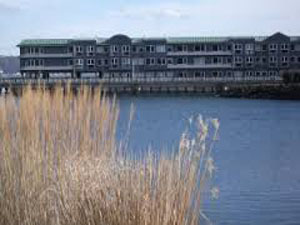 The Silver Cloud Inn, the hotel at one end of the popular walk, offers 90 waterfront rooms. Talk about a perfect place for a Staycation. Rooms come with breakfast, high-speed internet and complimentary parking. No more than three miles from most of Tacoma’s attractions, the Inn is definitely centrally located. But you wouldn’t have to leave the waterfront if you didn’t want to. If you’re not able to spend the night on the waterfront, at least eat. Restaurants about along Ruston Way and there’s not a bad one in the bunch. 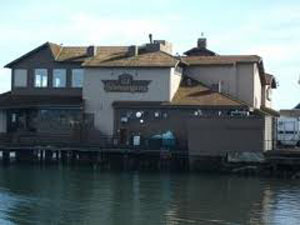 The Lobster Shop, Duke’s, Katy Downs, The Ram, Shenanigan’s and Harbor Lights all serve lunch or dinner or both. If you’re walking along the waterfront with a dog or two, you’ll fit right in. Joggers, roller bladders and bicyclists also share the path with pedestrians. The weather didn’t last, but the sunlit waters of yesterday still shine vividly in my memory. 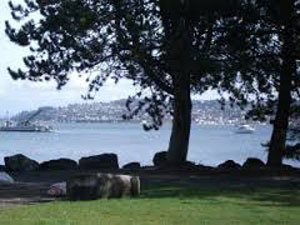 Hopefully, I won’t have to wait long for another sunny day and a walk along the shore of Commencement Bay. C.I. Shenanigans on Ruston Way. This entry was posted in Beaches, Free, Hotels and Other Lodging, Restaurants, Seasonal, Uncategorized and tagged Commencement Bay, Duke's, Harbor Lights, Katy Downs, Lobster Shop, Ruston Way, Shenanigan's, Silver Cloud Inn, staycation, Tacoma waterfront, Tacomans, The Ram on February 15, 2011 by Heather Larson. Oh, a walk by the water sounds heavenly. We have lots of water here, living on a 45,000 acre lake, but we haven’t been down to the water yet. We’ve just gotten rid of lots of snow and it’s a little chilly yet. Hopefully, we’ll both have lots of good weather for long spring walks soon!